Exhibition opening at the Ex-Chinese restaurant at Budapest 1114, Bartók Béla út 29. SRIAT: Social Responsibility in Art Today has been an initiative that took place on three different levels in the last two weeks: in an artists’ workshop, in the present exhibition At Wang’s and in the form of a public discussion at Ludwig Museum. The project aimed at inquiring into the possibilities of art as a factor of societal change through different means. SRIAT’s goal was to give a time frame and a free space for experimentation around an array of relevant issues (freedom of speech, domestic violence, nationalism vs. identity, centralized power contra democracy in the cultural field), introducing a democratic and collective approach to artistic creation. The workshop was led by the Berlin based artist Thomas Kilpper. Following an open call, 12 participants from Hungary and abroad were selected to collaborate with Kilpper in a think-tank format. The participants were working at “Wang’s”, on a location served as a Chinese restaurant until recently. The project room’s particular aesthetic based on the ephemeral characters and temporal aspects of the place. The restaurant’s walls have been turned into a visual documentation as an open diary constantly updated by the participants. The inner part of the space have been transformed into a labyrinth through collaborative approaches, using the interior design of the formal restaurant. The labyrinth also a site for personal statements and works from the participating artists too, while at the dead end we can see the sound- and video installations, intervention documentations and the performances on a display. The place has been continuously transforming during the workshop, therefore this environment should be understood more as a project room, the trace of a two-week long process. In addition to addressing the particular locale, the participants explored various politically or culturally charged sites of Budapest. 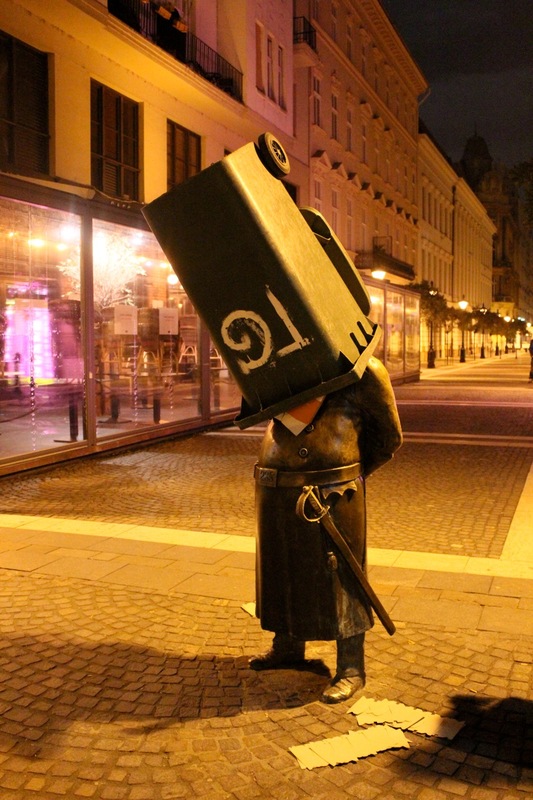 The protests of October 23 served as a field study for investigating large-scale social procedures within the Hungarian capital, while the actions targeting a number of public statues can be read as artistic micro-interventions into the city’s visual fabric. These ‘one minute sculptures’ are addressing actual social and political issues like the banning of bin-diving or censorship. Documentations of the interventions are integrated into the installation occupying the central space. Made out of discarded cassette and video tapes, the display system itself incorporates the DIY-tactics of political activism. The project SRIAT: Social Responsibility in Art Today was organized by Igor Metropol Association in collaboration with the Intermedia, the Art Theory and Curatorial Studies Departments of the Hungarian University of Fine Arts in Budapest.